One important component of keeping your cat happy and healthy for as long as possible is feeding her highly nutritious cat food. Choosing the best cat food can be challenging, but we compared several reviews on the best canned cat food to come to a consensus on these five leading brands. Cat foods on this list are certified by the Association of American Feed Control Officials (AAFCO) to be “complete and balanced,” meaning the food supplies all the nutrients your cat needs. This wet cat food comes in a can or a pouch and is grain free and gluten free. Their foods are processed in a facility that also processes human foods, so you can rely on rigorous health standards. Their original line of cat food features wild caught, dolphin safe tuna as the first ingredient. 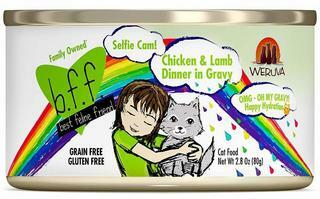 BFF also has a new product line of canned food called Oh My Gravy! (OMG) that features only land-based meats as the primary protein. Both dry and wet cat foods made by Tiki Cat are low in carbohydrates and grain free to focus on giving your cat the protein-packed nutrition she needs. There are four different canned food varieties, each with multiple flavor options. Open a can of Succulent Chicken and you’ll see shreds of chicken and real chicken broth—no highly processed mystery meat here. 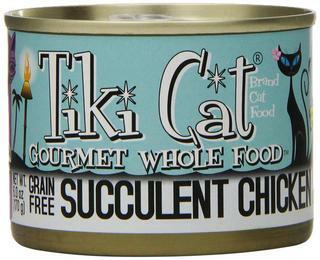 Tiki Cat claims that all of their products are sustainably sourced, mercury-free and dolphin safe. You’ll find five different flavors of Ziwi Peak canned cat foods, each made with 93% meat, organs and bone to pack a high-protein punch. The ingredients are 100% sourced from New Zealand using ethical farming practices. 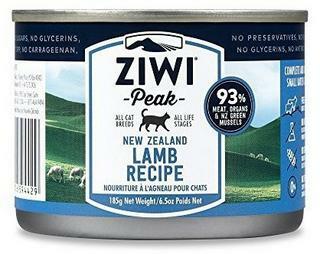 Ziwi Peak is designed to be equivalent to a wild prey diet and includes minimal ingredients. There are no fillers, by-products, or artificial additives so you can trust that your cat is consuming only the healthy nutrients she needs. 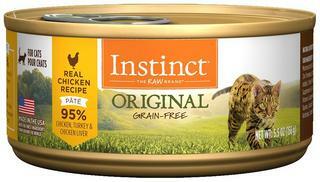 The Instinct line of Nature’s Variety canned cat foods are made with 95% meat ingredients and designed to offer the same nutritional quality of a raw food diet. Free from grains, by-products, and artificial colors or preservatives, Nature’s Variety includes only high-quality ingredients. They strive to keep their recipes as pure and simple as possible by using only real meats and digestible carbohydrates. All Wellness Core cat foods, both wet and dry, are grain free for better digestibility. There are five product lines for wet foods, each in varying textures and flavors so you can find one that best suits your kitty’s preferences. 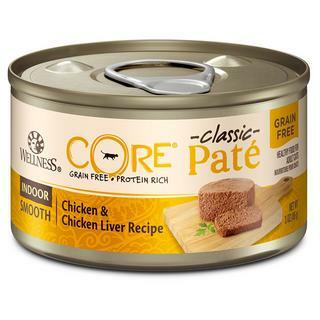 Wellness Core cat foods made to follow a holistic, natural approach to pet nutrition. They are free of by-products and artificial additives, and every recipe includes probiotics and essential fatty acids. There is a long running debate on wet versus dry cat food. Though it comes down to your cat’s individual preferences and needs, pet parents like wet cat food because it has a much higher water content and helps to keep cats hydrated, especially for those that are picky about drinking water.